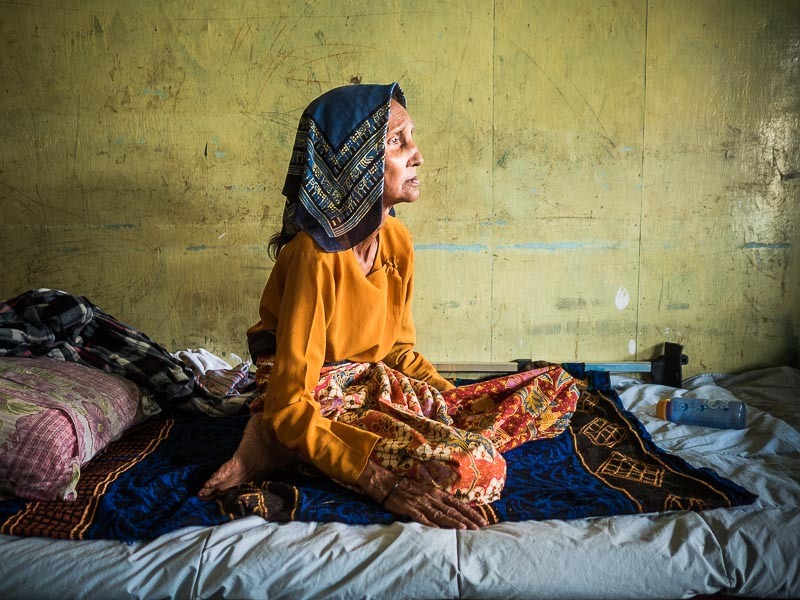 Ruhima, a 72 year old Rohingya refugee on the daybed she essentially lives in a home in Kulai. It should have been her “golden years,” a time when 72 year old Ruhima, a Rohingya woman living in Sittwe, the capital of Rakhine state in western Myanmar near the Bangladesh border, could watch her grandchildren grow up. Instead, in October 2012, she watched as mobs of Buddhists attacked her home and the homes of her Muslim neighbors, setting them ablaze, destroying their mosques and killing people. Many in her family were killed in the sectarian violence. Taking her life savings, Ruhima boarded a rickety fishing boat and fled Myanmar ending up in Kulai, Malaysia, where she now spends her time perched on a daybed, relying on the generosity of other Rohingya refugees in Kulai. The UN says the Rohingya, a Muslim minority in western Myanmar, are the most persecuted ethnic minority in the world. The government of Myanmar insists the Rohingya are illegal immigrants from Bangladesh and has refused to grant them citizenship. Most of the Rohingya in Myanmar have been confined to Internal Displaced Persons camp in Rakhine state, along Myanmar’s western border with Bangladesh. The government of Myanmar says it’s to protect the Rohingya from Buddhist mobs. But Rohingya in the IDP camps say they face constant harassment from Myanmar security officials and that they are held, imprisoned and unable to leave even if they want to. 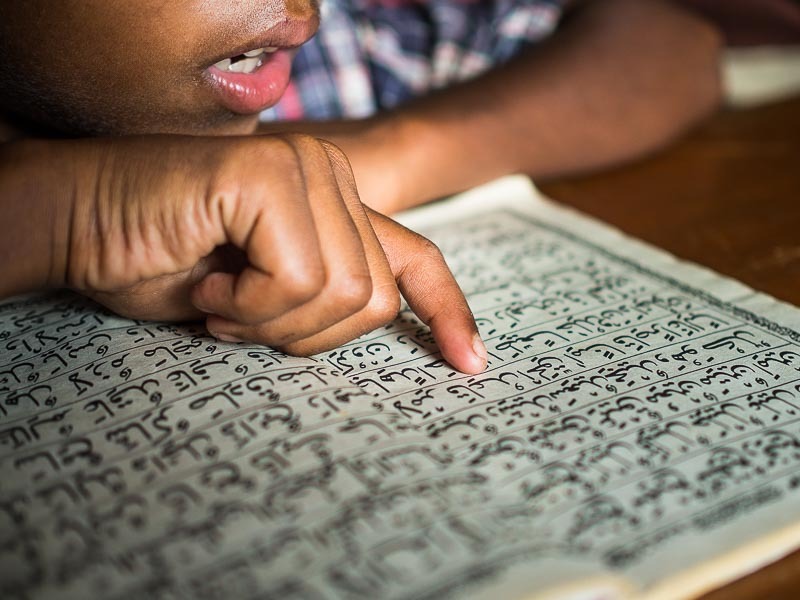 A Rohingya boy recites the Koran in a madrasa for Rohingya in Kulai. Rohingya children in their madrasa. There are holes in the roof and exposed wiring. Rohingya have been coming to Malaysia for decades. First they came on buses, making the perilous journey from their homes in Rakhine to Yangon (Rangoon) then to Thailand, and through southern Thailand into Malaysia. In the early 2000s, human traffickers started preying on the Rohingya, offering them passage on rickety fishing trawlers and the lure of jobs in Thailand or Malaysia. As their plight worsened more and more Rohingya came on the boats enduring an unimaginable hell to escape the unimaginable hell they were living in in Myanmar. Fozol Ahmad bin Habi thinks he was born in 1947 - but there is no official record of his birth so he’s not sure. He’s an Imam, a spiritual leader for the Muslim Rohingyas. He came to Malaysia 1992 by bus, before the trickle of Rohingya refugees became a flood. He preached in the Rohingya mosques in Kulai and supported himself by selling used books on the streets of Kulai. He doesn’t have a family - he said they were killed by the Rakhinese (the Rohingya word for Burmese Buddhists in western Myanmar) during an outbreak of sectarian violence in the early 1990s. Old beyond his years, the 68 year old man could easily pass for 80, bin Habi now relies on the kindness of his neighbors, “people help me because I am old and I’m an Imam (teacher)” he said sitting on his bed in the small room he calls home. He lives in a space smaller than a jail cell in a home shared by seven other Rohingya families. There’s a communal kitchen with a gaping hole in the roof. But it’s better than facing death at the hand of mobs in Rakhine state. Fozol Ahmad bin Habi, an Imam, walks towards his room in a house he shares with seven other Rohingya families. He is too infirm to work anymore and relies on the kindness of his neighbors for everything. 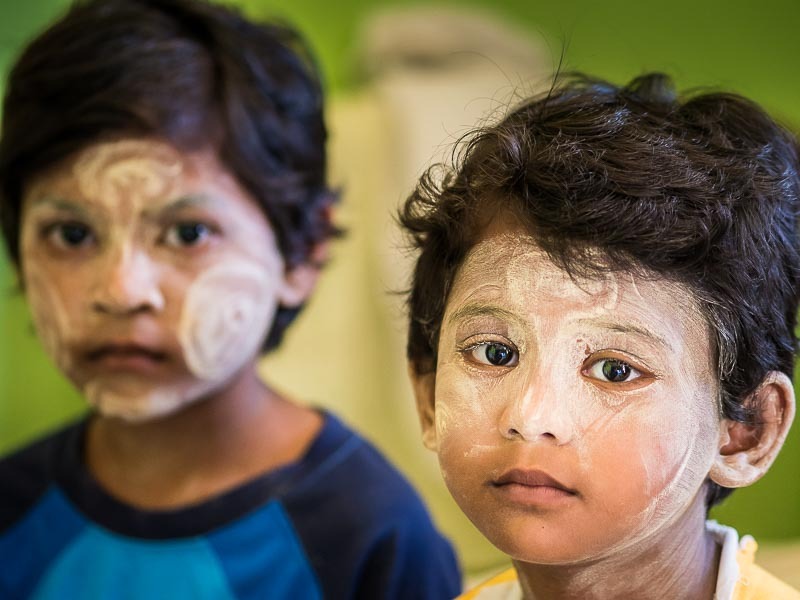 There are about 1,500 Rohingya refugees in the town of Kulai, in the Malaysian state of Johore. According to Rohingya in Kulai, only about 500 of them have been granted official refugee status by the UN High Commissioner for Refugees. The rest live under the radar, relying on gifts from their community and taking menial jobs to make ends meet. They face harassment from Malaysian police who, the Rohingya say, extort bribes from them. The Malaysian government requires proof of citizenship for public education. 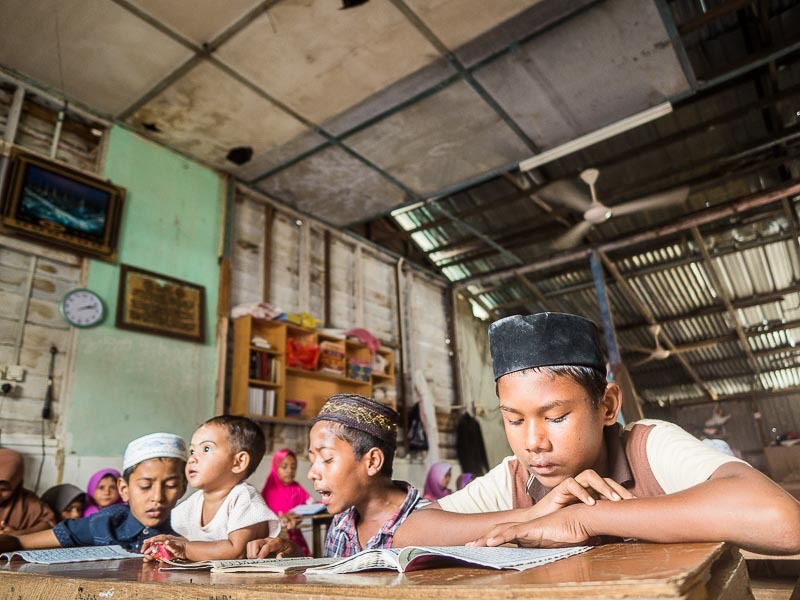 The Rohingya are not Malaysian citizens and don’t have papers, so they can’t put their children in Malaysian schools. The Rohingya don’t qualify for the Malaysian health care program, so they have to pay cash for doctor visits and medications. They have no recourse if they’re robbed or otherwise victimized. But still, it’s better than the life they left in Rakhine. Menial day work, like cleaning out storm sewers as these men are doing, is the only employment most Rohingya can find in Kulai. Mohammed Shafi bin Haber is a bear of a man - burly, with a quick smile who chain smokes cigarettes. He’s a leader in the Rohingya refugee community in Kulai. Sitting on the floor of his living room, drinking a thick sweetened coffee, he talks about the plight of the Rohingya in Malaysia. He said it’s hard for Rohingya to get UNHCR (United Nations High Commissioner for Refugees) identity cards. He said they have to travel to Kuala Lumpur, about six hours away by train, and apply in person to the UNHCR. 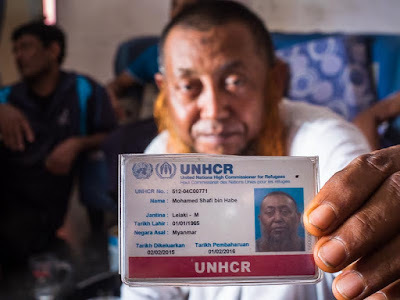 During the journey, they’re subject to arrest by Malaysian authorities because the Rohingya (and other refugees in Malaysia) are considered illegal immigrants without the UNHCR card. They can’t travel without the card, which means they can’t travel to get the card. Without the cards, he said, the Rohingya face arrest and possible deportation by Malaysian authorities and for many, being forcibly returned to Myanmar is a death sentence. Mohammed Shafi bin Haber shows his UNHCR identity card. 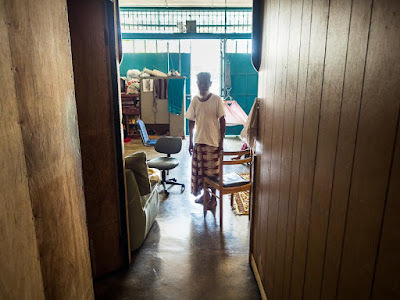 Holding his leg, Rupok continued, “I paid a trafficker 4,000 Malaysian Ringgits (about $1,100 US) to take me out of Sittwe.” He said first they were brought to Thailand, to one of the now infamous death camps on the Thai / Malaysian border. Rupok said he was repeatedly beaten while they were at the camp. Rolling up a pant leg, he then displayed a leg scarred by cigarette burns, “They burned me. Over and over and over again. All the time. It was torture.” His voice dropping to a whisper, he said, “We were living like animals with only a piece of plastic over us. I saw 26 people killed in the two months I was in the camp.” Then his eyes glazed over and he went silent. Recent events have thrust the Rohingya back into the international spotlight. Thousands of Rohingya paid traffickers and put to sea in rickety fishing boats from the marshes around Sittwe. Short of food and water, hundreds may have died. Nobody kept records of how many people were on each boat. With the discovery of the “death camps” along the Thai / Malaysian border, Thailand started cracking down on human traffickers, like those who tortured Rupok, bringing a small measure of hope to those still trapped in Myanmar. Prior to May 19, the standard practice of Thailand, Malaysia and Indonesia, was to tow the Rohingya boats back out to sea and cut them loose. On May 20, Malaysia and Indonesia, where thousands of Rohingya have fled to, announced that they will no longer tow the Rohingya boats back out to sea. Thailand was absent from the announcement. 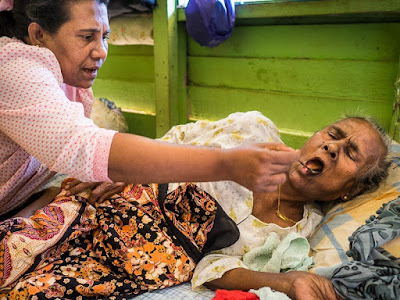 A Rohingya woman feeds her 90 year old mother in a Rohingya home in Kulai. Thailand convened an international conference on May 29, to discuss the plight of the Boat People. Malaysia, Indonesia and Bangladesh (along with host nation Thailand), the countries that have received the most Rohingya, immediately announced plans to attend the conference. Myanmar said their representatives would not attend if the conference was focused on the Rohingya because, according to the Myanmar government, the Rohingya are illegal immigrants, not Myanmar citizens. The conference was called “Special Meeting on Irregular Migration in the Indian Ocean” with no mention of the Rohingya. Volker Turk, of the UNHCR, however singled out the treatment of the Rohingya people at the hands of the Myanmar government as a root cause of the crisis, and the representative from Myanmar responded by saying Turk was not familiar with the history of the region. After the conference the United States announced it would accept Rohingya refugees (the US has already taken in about 1,000 Rohingya) and the Philippines announced it was willing to accept Rohingya. Thailand announced it would no longer tow the Rohingya boats out to sea. Myanmar announced it would participate in search and rescue efforts. The boat people crisis, which flared up in early May, appears to be easing. But the plight of the Rohingya in Malaysia is as desperate now as it was before the boat people captured the world’s imagination. Ruhima, a Rohingya woman, came to Malaysia in 1988, well before human traffickers made the journey a life threatening trek. 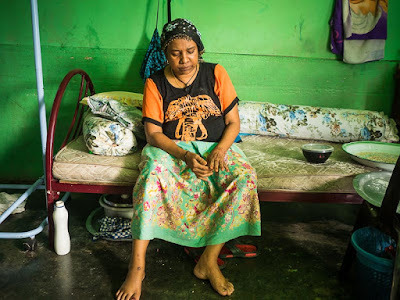 After 27 years in Malaysia, her life is no easier than it was when she arrived. She said she was in bad car accident traveling to Kuala Lumpur, the Malaysian capital, in 2005. Her husband and son were killed in the wreck and her leg was badly injured. She can no longer walk or work. She can’t afford the insulin she needs to control her diabetes. She makes small sweets and candies she sells from the room she lives in (in a house with four other Rohingya families) but she literally does not know where her next meal will come from. Ruhima is a widow and a diabetic. The car wreck that took her husband's life also took her son's life. She is alone, living in a bed in the "living room" of a home other Rohingya families share. She makes and sells sweets from her bed that she sells to neighborhood children. Zahida, another Rohingya woman, said her son works as a car mechanic and makes about 20 Malaysian Ringgits a day (a little more than $5 US) but he’s been targeted and repeatedly arrested by Malaysian police because he doesn’t have papers. It can cost him two days salary to buy his freedom from the police. Rohingya children in Kulai. They lead a perilous life in a country that doesn't want them and unable to return to the country that is their ancestral home. There are more photos of the Rohingya in Kulai, and photos of their lives in Myanmar, in my archive or available from ZUMA Press.